"Oh no! What have I done?!" "Oujosama to oyobi!" I've forgotten where this info came from. Sorry! Edited by yours truly (contact me). The images came from Who Wants to Know? and Ayeka Gallery. Princess of Jurai, and older sister of Sasami. Originally intended to marry her older half-brother Yosho, Ayeka's marriage plans were ruined after Ryoko's attack upon Jurai. Yosho had left Jurai to chase Ryoko down and had never returned. Ayeka left Jurai for Earth in order to find her long lost brother, Yosho. She later learns that he has had a daughter, and subsequently a grandson. Although Ryuoh (Ayeka's starship) itself has been rendered useless, Ayeka remains to control Ryuoh's Key which she uses for her defensive and offensive attacks. Ayeka is a very demanding individual. She retains much of Jurai formality, and tries to set a definitive identity from that of Ryoko. Ayeka also maintains strong feelings for Tenchi, and will do absolutely anything to win his affection. The above description came from Anthony Murphy, and was edited by yours truly (contact me). 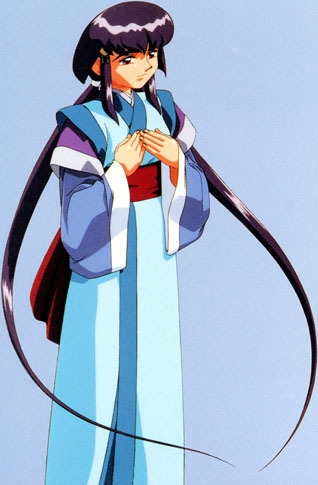 Princess Ayeka of Jurai had originally been betrothed to her half-brother Yosho, but he left about 700 years ago to chase the notorious space pirate Ryoko. After some time, Ayeka began to worry. She and her younger sister Sasami took off in her own ship, Ryu-oh, in search of him. After 700 years of stasis, the ship's Guardians, Azaka and Kamadake, awaken Ayeka, informing her: (1) She's reached a planet called Earth, (2) They've found Ryoko, and thus the best chance of finding Yosho, and (3) The statute of limitations on Ryoko's criminal file expired soon after Ayeka had awakened. With that, the ship approached the Masaki house (where Ryoko was) and demanded that Ryoko appear. Ryoko answered the challenge by summoning Ryo-ohki and chasing her into space, but Ayeka caught her unaware and captured her and Tenchi with the Guardians. At this point, Ayeka discovers that Tenchi had Yosho's Master Key (the sword Tenchi-ken), and she questions Ryoko. After some torture, Ryoko bluntly tells her that the sword Tenchi belongs to the man Tenchi. She later questions Tenchi and hears something she never thought she'd hear: Yosho had died a long time ago, and Tenchi was his descendant. That was why Tenchi was able to use the sword. She had no time to ponder, however, as Ryoko forced her ship to crash back on Earth, marooning her. Eventually surrendering to the fact that she wasn't going anywhere for a while, she took in the sights, and began to gain a fascination for Earth and affections for Tenchi. Later, Ayeka discovers that Yosho is still alive. He was Tenchi's grandfather, the keeper of the shrine! Bored and exasparated could possibly decide Ayeka's feelings as she cruises back to her home planet Jurai after a lengthy marriage meeting on some distant world. Suddenly, Mihoshi's crazy luck kicks in, as her ship receives her distress signal. She proceeds to Earth to answer the distress signal. But when Ayeka finally arrives on the scene, guess who she runs into but the biggest thorn in her side: Ryoko! Well, that aside, Tenchi's grandfather convinces Ayeka to take a day off of her duties and enjoy Earth for a while. Tenchi is asked to accompany her on a scenic walk through the woods. It would be a walk that would stir new emotions in Ayeka and put her in an uncomfortable position, both with her royal obligations and with Ryoko (who apparently doesn't like Tenchi being anywhere near her). She and Ryoko ultimately take their respective ships and duke it out in Earth orbit. However, Ryoko's own ploy to anger Ayeka backfires as Ayeka does something totally unprincesslike and causes everyone to be stranded on Earth. Just as well. She decides to turn her situation around and turn her day off into an extended vacation. She still has to sort out her situation and deal with both her hatred toward Ryoko and her feelings for Tenchi.